Includes 7-pin trailer wiring harness, class III frame mounted hitch receiver, heavy-duty shock absorbers and heavy-duty 72-AH battery. Includes 3.55 axle ratio, P255/70R16SL all-season black sidewall tires and heavy duty shock absorbers and springs. Increases GVWR to 6600 and payload to 2370. Includes cloth captains chairs with driver and passenger lumbar support and console. Includes four (4) P235/70R16 outlined white letter all-season tires and fullsize black sidewall spare. Includes 7-pin trailer wiring harness, class III frame mounted hitch receiver, heavy-duty shock absorbers, heavy-duty 72-AH battery and auxiliary transmission oil cooler. Includes 5.4L V8 engine with 260 HP @ 4500 rpm and 350 ft-lbs of torque @ 2500 rpm. 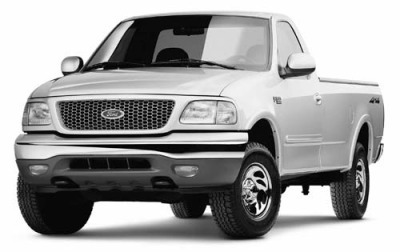 Includes color-keyed molded running boards, wrap-around hood deflector and hard plastic bed liner. Includes larger brakes, higher capacity 7-lug 16" wheels, five LT245/75R16D black sidewall all-season tires, heavy-duty frame, heavy-duty 72 AH battery, radiator upgrade, auxiliary 14-plate engine oil cooler and 3.73 axle ratio; upgrades GVWR to 7700. Includes 7-pin trailer wiring harness, class III frame mounted hitch receiver, heavy-duty shock absorbers, heavy-duty 72-AH battery and auxiliary transmission and engine oil coolers. Includes P275/60R17 outlined white letter all-season tires, front dark graphite cloth 40/60 split bench seat, Kenwood Z828 MP3/CD radio, Sirius Satellite ready, with wireless remote control, removable faceplate, clock, body color grille surround with chrome ring and black billet grille insert, medium tonal brush applique on instrument panel and door plates, chrome tubular running boards and exhaust tip, power mirrors, body colored wheel lip moldings, front and rear bumpers, and lower fascia,17" Chrometec styled wheels, STX decal, clear headlights and park lights,unique fog lights, new accent colored valance and 3.55 axle ratio. Includes larger brakes, higher capacity 7-lug 16" wheels, five LT245/75R16D black sidewall all-season tires, heavy-duty frame, heavy-duty 72 AH battery, radiator upgrade, 7-pin trailer wiring harness, class III frame mounted hitch receiver, auxiliary 14-plate engine oil cooler, 22-plate transmission cooler and 4.10 limited slip axle ratio. Upgrades GVWR to 7700. Includes AM/FM stereo with 6-disc, in-dash CD changer and clock. Includes four speed automatic transmission with overdrive and auxiliary transmission oil cooler. Includes 4.6L V8 engine with 231 HP @ 4750 rpm and 293 ft-lbs of torque @ 3500 rpm. Includes AM/FM stereo with cassette and single-CD player, integrated amplifier & equalizer, clock and 4 premium speakers.